« Gabrielle. A Harley Dyna Wants To Become A Tracker. Published by Cyril Huze March 29th, 2016	in Customs, Editorial and Wheels. Until now, there has been very little you could do about the unsightly black sensor on the axle of all 2009 and later ABS equipped Harley-Davidson motorcycles. The new Ride Nice Bagger Front Wheel Spacers solve that problem for all late-model Harley-Davidson touring bikes. 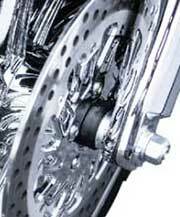 For those motorcycles with a custom aftermarket front wheel the company offers ABS and non-ABS spacers as well. 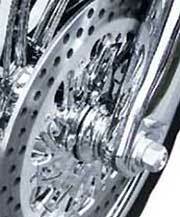 Available in show chrome, black anodize or raw machined aluminum. Order at Ride Nice. They are lighter than chromed steel normally found. And no way of getting away without them. They are not new ! I’ve been making abs spacers since abs was introduced in late 2007 .I’ve been selling these smaller diameter spacers since the new Harley Enforcer and Impeller were introduced in the summer of 2013. I own WILLY SHINY a chrome exchange company and have sold tons of these spacers with my chrome wheel exchanges .